We have entered the time of Winter where landing double digits in species count on a day out in the field has become tougher. The last few bird outings were not successful at all...either in chasing down a lifer or picking up species for my year list. For example, last weekend, I went out to Floyd Bennett for the Black-headed Gull and then to Fort Tilden for Crossbills and came up empty on both. Not to be dissuaded, I tried for the Crossbills at the Brooklyn Botanical Gardens and came up short there as well. Despite the setbacks I remained positive and enjoyed those species that I saw with the perspective that there is always another day. The good news is, that with misses there are hits and one such hit was, I landed my first Eastern Bluebird of the year in Teatown NY. The next hit or hits was the result of a remarkable day out at Jones Beach, birding with some two of from the crew regarded as "The Jones Beach Boys", Joe Guinta and Sy Schiff I had a good time birding with them and while I did not land the Crossbills (yet again), I picked up a Snowy Owl and Eared Grebe...both lifers. In addition, I was able to add 9 birds to my 2009 list and made up some ground on Joe and Sy who have already broken the century mark for the year. The message that a Ross's goose was seen at Floyd Bennett came through on Tuesday and I could not resist the urge to join the chase in seeing what was possibly a Brooklyn first or second recorded sighting. Today, I set out on the chase; unfortunately, the goose proved elusive. I searched various parts of the field with a few other birders, but we could not land the prize. There was, one goose that raised a few eyebrows and I was asked to take a look. 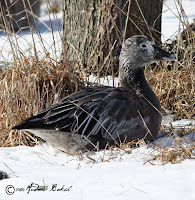 After driving to the location where the goose was sighted and reviewing the subject, I decided that it was an immature "Blue Morph" Snow Goose. Further confirmation later in the evening with my friend and well known birder and naturalist Don Riepe, proved that the call was correct. Despite the disappointment at not finding the Ross' geese, I was happy at the good looks I had of other birds. They include Horned Larks, Swamp Sparrows, White-crowned Sparrows, Song Sparrows, White-throated Sparrows, American Tree Sparrows and Eastern Meadowlarks. In fact, I was able to get a much better photo of the Meadowlarks and counted about 10 of them. 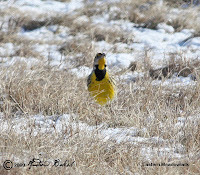 The presence of Meadowlarks at Floyd Bennett, in my opinion is a big deal because it suggests that they are over wintering. This, is a boost to the ongoing efforts of restoring the grasslands in this area. Hopefully in time we may see these birds breed at Floyd Bennett. Nothing like back to back birding. Following yesterday's walk at Pelham Bay Park, I decided to venture out to Floyd Bennett Field to see if I could find any Snow Buntings or the Eastern Meadowlarks that I had a glimpse of when I was out with Ron Bourque. 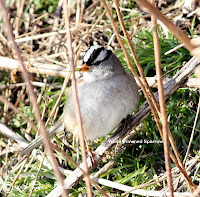 My first stop was around the cricket field, where I got Canada Geese, Brandts, Snow Geese, American Tree Sparrows, Song Sparrows, Yellow-rumped Warblers, Juvenile White-crowned Sparrow and White-throated Sparrows. While there was no sign of Horned Larks or Snow buntings on the field, there were several fly overs of Snow Buntings, that I tried to wish onto the field, but after a few teasing loops, they continued on towards Dead Horse Bay. After about an hour, I headed out to the abandoned runways to see if there was any action there and to check out the adjoining grassland area. The abandoned runway was treacherous with sheets of ice covered by the fresh powdered snow, making walking a tad hairy. Nevertheless, I pushed on and was rewarded when I saw movement in the grassland area. Since I had the scope with me, I patiently scanned the field and found the Eastern Meadow Larks that had eluded my search just a week ago. I had good looks, but had to constantly track the ever moving birds as they foraged for food. I spent a good hour or so there and then headed on towards Raptor Point to scan the water for water fowl. My stop there was short as there was not much happening; I did get Common Loon, Red-throated Loon, Bufflehead and Red-breasted Mergansers. Species seen throughout the day totaled 21...well make it 22 as I spotted an American Kestrel over by Erskine exit while on my way home. Today, in frigid temperatures, I headed out to Pelham Bay Park for an Owl walk with the Urban Park Rangers. I arrived just around 11:00 a.m. and met Rangers, Kathy, Adelaide and Mara at the Nature Center. We were chatting outside the center, when Ranger Adelaida, indicated that something had flown in on one of the trees. 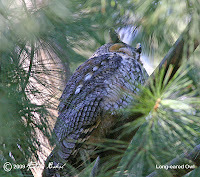 I scanned the area and found the subject; the bird was too big to be a Hawk…could it be, I quickly brought up my bins and shouted with glee, “Great Horned Owl.” I could not believe it; here I was getting ready for an Owl walk and who shows up, but a Great Horned Owl. I tried to get my camera for a photo, but the Great Horned who by now was being harassed by Blue Jays decided to leave and with a few flaps of its magnificent wings, was quickly gliding among the trees. We tracked it and got additional looks before we lost it in the trees. Three of us, walked out to the trees where we lost it, hoping that it might have perched, but with the Blue Jays, no longer fussing, I knew that the Owl had moved on. If we were looking for a good omen to start the day, then nothing else could top this. I was pumped and looked forward to the rest of the walk. By then, we were joined by one other birder, Johnny, and the five of us boarded a Parks Department Van and headed out to Hunter’s Island. At Hunter’s Island we were joined by two additional Rangers, who were also hoping to find Owls. The group headed over to the Pine Grove; the same place where I had seen Long-eared Owls back on January 3rd and began searching. While there, I met a couple of knowing faces…fellow birders, Tom B. and his wife who indicated that they had not found any Owls. It appeared we were not having much success, when Ranger Kathy beckoned me over and pointed up into the high up branches of an Eastern White Pine. 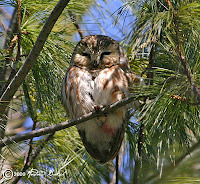 There in the sun taking a nice snooze was a Northern-saw Whet Owl. A cool sight indeed! I was able to get a few photos even though the Owl was pretty high up and partially hidden by pine needles. Everyone got good looks and we continued searching the rest of the Pine grove, but could not find any other Owls. After about half an hour, we left the Eastern White Pine grove and headed along the Kazirimoff Nature Trail towards another grove of Norway Spruces. Along the way we stayed alert looking for the Great Horned. While there was no sign of the GHO; we did see a number of birds including Red-tail Hawks, Red-bellied Woodpeckers, White-throated Sparrows, Song Sparrows, Tufted Titmice and Carolina Wren. We got to the Norway spruce grove and did a thorough search, but could not find any Owls; that is not to say nothing was there. The Norway spruce is a very tall tree and Owls could easily hide in the topmost branches, making them hard to find. As we were leaving the grove, an immature Red-tail Hawk flew in and was very cooperative giving us fantastic looks and posed for many photographs that I took. We got back to the van and headed back to the Nature center ending our walk with the Rangers. 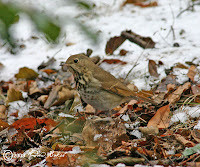 I decided to continue birding and headed out to Eastchester Bay; along the way I found additional birds including Hermit Thrushes, American Tree Sparrows, Fox Sparrows and an Eastern Tohee. I decided to call it day around 3:30 and headed back home. It was a fantastic day of birding and the Urban Park Rangers were great spotters and excellent hosts! I look forward to birding with them in the near future. Species seen include Great Horned Owl, Northern Saw-whet Owl, Blue Jay, Red-bellied Woodpecker, Tufted Titmouse, Downy Woodpecker, Carolina Wren, American Robin, Northern Cardinal, Northern Mockingbird, American Tree Sparrow, Fox Sparrow, Song Sparrow, White-throated Sparrow, White-crowned Sparrow (Juvenile), House Sparrow, Canada Goose, Eastern Towhee (Male), European Starling, Hermit Thrush, Red-tail Hawk and Northern Harrier for a total of 22. Things continue to be relatively quiet in the backyard, with the usual visitors. I did get three Red-wing Blackbirds which was an increase of two as I have had one visiting the feeders over the past month. 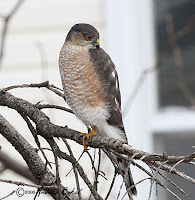 The recent highlight is an adult Sharp-shinned Hawk, who put on a spectacular display in maneuverability in the backyard. I had the pleasure of observing this bird for over 2-3 hours, who in that time had one kill and two very close misses. I am still looking out for that new species for the backyard list, but I am enjoying the regulars who visit the feeders. Speaking of feeders, I just finished making a suet feeder, which consisted of a discarded tree branch that I just cut to size and drilled holes for the suet. The downy seems to like it a lot and has been feasting on the home made suet that I fill the holes with. On Sunday, I went out to Jamaica Bay Wildlife Refuge, to see if I could unearth anything new. Last week, the West Pond was frozen and again, it was pretty much the same, with even smaller open areas of water. It was very cold around the pond with a fierce wind, coming across the water, but I stuck it out to take a closer look at the Gulls that were hanging out. The Gulls turned out to be the standing species we usually get in Ring-billed and Great-black Backed. 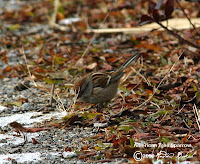 Along the trail I picked up White-throated Sparrow, American Tree Sparrow, Northern Cardinal, American Crow, Northern Harrier and Song Sparrow. 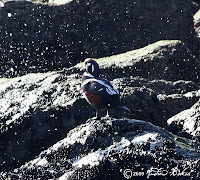 Over in Pumpkin Channel , the tide was low; nevertheless, I walked out to Terrapin point and saw a few American Black Ducks, Buffleheads, Red-breasted Mergansers and some of the afore mentioned species. 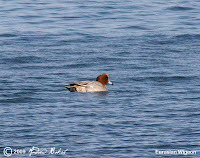 Around bench 11 out on the West Pond, I found about 6 Northern Pintails which was a nice find and something that I did not see last week. 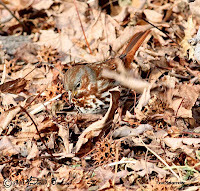 Finishing the loop, I ventured into the North Garden and South Gardens, where I got Robins, Hermit Thrushes, Carolina Wrens, Yellow-rumped Warblers and a Downy Woodpecker. I did not see the Yellow-breasted Chat, that I had seen last week, but that is not to say that it was not there...I may have just missed it. The next time I get out to Jamaica Bay I will have make a stop over at Big John's pond to see if I find anything over in that area. Oh yes...and on the way back home on Crossbay Blvd, I had a flyover of a Great Blue-Heron...could well have been the same one that I saw last week. Today, I went to Floyd Bennett field for a birding walk which was led by Ron and Jean Bourque. We met up at the Ranger station and while discussing our plan of action, we had excellent looks at a Northern Harrier, that flew right by us and also had looks at Northern Flickers and American Crows. Our first stop was at the Pine Grove; our walk among the lovely Eastern Whites Pines (I love these trees), did not reveal much...though we did see a couple of Red-breasted Nuthatches. There was white wash around some trees, but no pellets or Owls. I was encouraged though, so I will be going back there to check. From the grove, we headed out to the cricket field in search of Horned Larks and we did find about 12, a much smaller flock than the 40 that I had seen a few weeks ago. 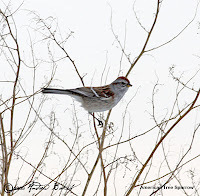 While enjoying the Larks, we also saw a few Song Sparrows, White-throated Sparrows, Tree Sparrow, Juvenille White-crowned Sparrow, Snow Geese, Canada Geese and Brandt. After about an hour, we decided to check out the runways to see if Snow Buntings might be around. 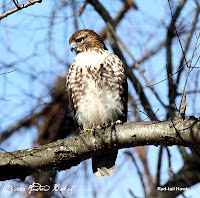 While parking, I noticed a Hawk in the far distance perched in a tree; looks through the scope at first indicated a Red-tailed; however when in flight there was some doubt leading to the speculation of a Rough-legged Hawk...I stuck to my initial assessment of Red-tailed. We walked a little bit more than half of the runway, but could not find any action on the ground, so we decided to head to the parking lot overlooking Jamaica Bay to get a look at water fowl. On our way to the lot we flushed a small flock of Meadowlarks on our right, but lost them in the grass and could not locate them again even after about 20-30 minutes of scanning the grass. We continued on to the lot overlooking Jamaica Bay where we got looks at Common Loon Red-throated Loon, Horned Grebe, Brandt, American Wigeon, Bufflehead, Red-breasted Merganser, Ring-billed Gull, Greater Black-backed Gull, and Double Crested Cormorant. After about 45 minutes, we left that area and drove to another location just before Raptor Point and saw many of the same species we had seen before in addition to nice looks at a Red-tailed and Sharp-shinned Hawk. It was a good morning out and I am glad we got some birding before the pending Snow storm. Today, I went for an afternoon walk at the Jamaica Bay Wildlife Refuge. Hiking the West Pond trail revealed that the pond remain frozen with the exception of small patches of unfrozen water that was occupied by Snow Geese, Mallards and Brandts. 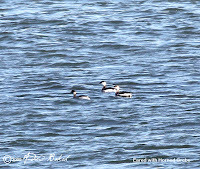 A walk over to the point at Terrapin Trail found a bit more action in Buffleheads and Redbreasted Mergansers. 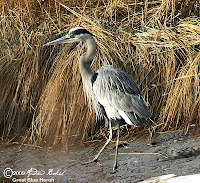 Further along the loop looking out to Pumpkin Patch Channel between benches 9 and 10, I found Horned Grebes, Hooded Mergansers and a nice close look at a Great Blue Heron that was hanging out on the edges of the West Marsh. I ran into another birder who gave me her name as Yael (hopefully, I got the spelling right) and together we continued around the loop into the North Garden. The North Garden was quiet with only sightings of an American Goldfinch, Robins and Yellow-Rumped Warblers. We made our way into the South Garden and had a nice surprise sighting of a Yellow-breasted Chat, a couple of Hermit Thrushes and a lone Cedar Waxwing. There was also possibly the presence of another warbler besides Yellow-rumped; however, it was a quick view and it was too far off to make a positive ID, so I will withhold any speculation. It just gives me an incentive to make another visit to the South Garden sooner rather than later. A total of 8 birders/naturalists gathered at the Pelham Bay Park subway stop around 9:00 a.m. to embark on a winter walk at Pelham Bay Park.Our guide Ron Bourque, selected the subway stop as our meeting point to facilitate those taking mass transit and from there we car pooled to our first stop which was Eastchester Bay. Making our way from the parking lot to the Bay, we had good looks at several Monk Parakeets, which had nests in every one of the floodlight platforms that overlooked the soccer field…surely some extra work for maintenance when the lights have to be changed. Along the trail to the Bay we saw, White-breasted Nuthatches, Red-bellied Woodpeckers, Red-tailed Hawks, Dark-eyed Juncos, Blue-jays and Tufted Titmice.Once we got to the Bay, we immediately saw Brandts, Ring-billed Gulls, Mallards and Red-breasted Mergansers.Further out in the water were Greater Scaup and American Black Ducks. 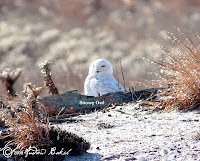 While some in the group were taking in the water fowls, others were scanning the landfill to our left and a dark looking bird that was perched on the fence that surrounds the path from the Bay caught our attention. From our bins, it was not very clear, but Red-tailed hawk was ruled out as well as our accipiter’s (Cooper’s and Sharp-shinned). Ron, got the scope on the bird and after a few looks of the bird on it's perch, I decided that it was a dark morph Rough-legged Hawk. After looking and seeing the bird in flight, Ron concurred. Many in our group were pleased at the find, as it was a lifer for some.Ron also found a Kestrel, which was scoped and everyone had good looks as well. The landfill had a lot of Hawk action as we observed several Red-tailed Hawks kiting over the landfill, briefly giving us looks only to disappear on the other side in search of prey. After leaving Eastchester Bay, our next stop was Hunter’s Island, where Ron and his wife Jean led us to Long-eared Owls; this was the highlight for the group and for many it was a lifer. Shortly after, we broke for lunch and then continued birding the trail walking on the other side that looked out to the Long Island sound. 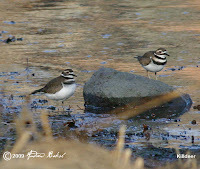 On this trail, we got more water fowl, in Buffleheads, American Wigeon, Eurasian Wigeon and came across 8-9 Killdeer. We continued on the trail in search of Great Horned Owls, but did not find any despite several trees that we found with good cavities for nests. We wrapped up our walk around 3:30 p.m. with everyone expressing their satisfaction on a fantastic hike and looking forward to the next Audubon walk. It was a decent day of birding and we ended up with a total of 32 species - American Black Duck, American Goldfinch, American Kestrel, American Robin, American Wigeon, Blue Jay, Brandts, Bufflehead, Canada Geese, Carolina Wren, Dark-eyed Junco, Downy Woodpecker, Eurasian Wigeon, Greater Scaup, Hooded Merganser, Killdeer, Long-eared Owls, Mallards, Monk Parakeets, Mute Swan, Northern Cardinal, Northern Flicker, Northern Harrier, Northern Mockingbird, Red-Bellied Woodpeckers, Red-breasted Merganser, Red-tailed Hawks, Ring-billed Gull, Rough-legged Hawk, Tufted Titmouse, White-breasted, Nuthatch and White-throated Sparrow. We are in the midst of Winter and I keep looking out for possible surprises with not much luck. 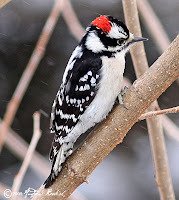 Nevertheless, I am still treated to most of the usual visitors including, the Red-belied Woodpecker, Downy Woodpeckers, White-throated Sparrows, Song Sparrows, Dark-eyed Juncos, Blue-Jays, Cardinals, Titmice, Red-winged Blackbirds etc. 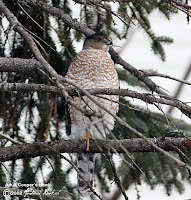 While none of these are new, I have been lucky to note a lot of raptor activity and it appears that I could have up to five Hawks hunting in the backyard. This morning, I was treated to the hunting tactics of a Sharp Shinned and it was magnificent. I would love to get some of the dives and flight on video...and I may just plan on it. I have never before recorded this many Hawks in the backyard and I am very pleased to see that even though the borough of Queens has suffered from over development, these birds have shown their resilience by adapting to the changes. Raptors are one of my favorite bird types for many reasons, including their intelligence, loyalty, grace, strength and independence. They play a critical role in maintaining a healthy ecosystem and I cringe when I hear about any loss of habitat that may negatively affect these birds. I have posted four images. 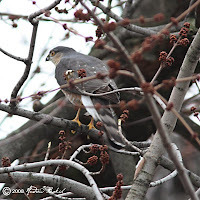 The first image, is of the Female Adult Cooper's Hawk that has been a regular. 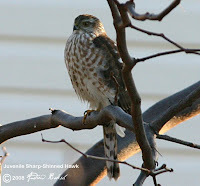 The second image is of a Juvenile Cooper's Hawk. 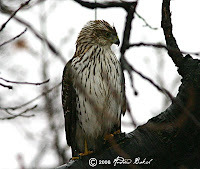 The third image is of an Adult Sharp-shinned Hawk and the last image is of a Juvenile Sharp-shinned Hawk. I have yet to get a decent shot of the Red-tailed Hawk, but that would be number five. Five Hawks hunting in my backyard...cool isn't it.